Week 38: Tinker Bell. I don't know how long my daughter has wanted me to make her this lunch. Who doesn't like the story of Peter Pan, Wendy, the Lost Boys, and of course Tink! I actually did it a few weeks ago and finally am able to post it. It is actually one of my favorites as well, so I saved it for last. Everyone keeps asking me if I am going to run out of ideas. But you know kids, they come up with something new that they like all the time, so I'm not worried. But since it is the end of the school year, I am switching gears a bit and am going to introduce Lunchbox Dad's "Simple Summer" next week. You wont want to miss it and the debut will help you if you need some ideas on what to make for the $4th of July. Anyway, enjoy making this lunch and don't be intimidated--you can do it parents! By the way this was made in an Easy Lunch Boxes Container, check them out, they are great! 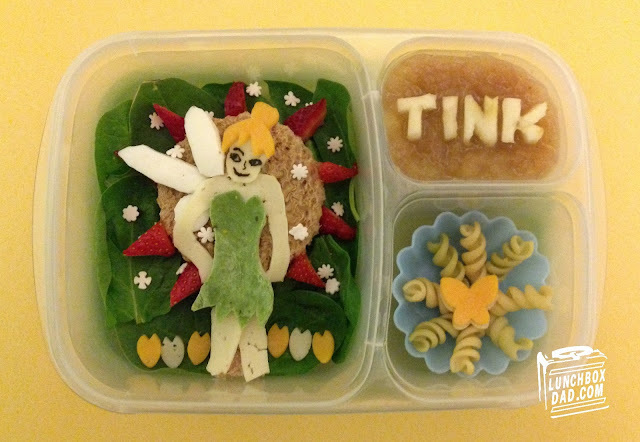 Using the template as a guide, cut Tinker Bell’s dress out of spinach wrap tortilla. Use the guide again to trim a piece of white cheese to form her shoulders and arms. Cut separate pieces for legs and head as shown in picture. Trim cheddar cheese in the shape of Tinker Bell’s hair. Cut egg white into two oval pieces of Tinker Bell’s larger wings and one piece of egg into small circular wing. Use round cookie cutter or a water glass as a guide to cut the slice of bread into a circle. Shape cheese into six small tulip shapes and two butterflies. Place spinach in the container as the background. Arrange bread, cheese pieces, strawberries, and egg wings on spinach. Place dress on top of Tinker Bell’s body. Mix equal parts yellow, blue, and red food coloring in a small bowl to make the color black. Dip the end of a toothpick in the black coloring and use it to draw the details on Tinker Bell’s face. Use blue food coloring for eyes. Fill small container with applesauce. Cut apple slice into the letters T-I-N-K. Place apple letters on top of applesauce. In second side dish, arrange pasta in circular shape as shown. Set cheese butterflies on top of pasta. Finish by randomly placing white sprinkles around Tinker Bell. Have a great last week of school and make sure to check back later for Lunchbox Dad's Simple Summer. Also follow me on Facebook, Twitter, Pinterest, and Instagram for all of your updates and more!